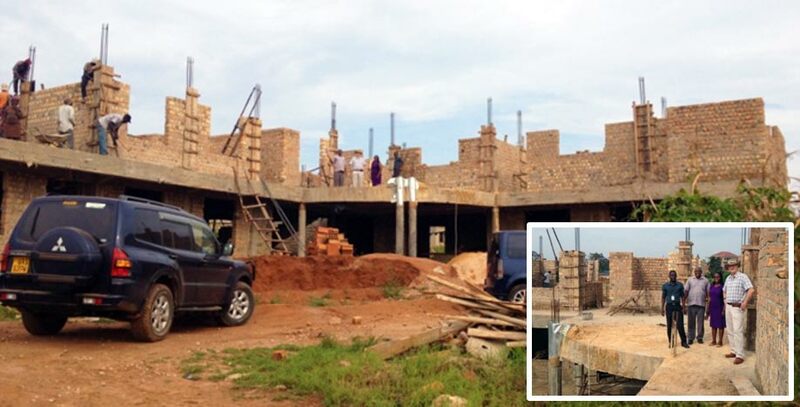 Over the past 2 years, the BrisDoc Community Fund has been funding an ambitious project to build a brand new primary care health centre in Kampala, one of the poorest, most neglected and under resourced areas of Uganda. After a slow start, the project has sprung into life making some fantastic progress over the past 12 months. With that in mind it was high time for a visit to see for ourselves the amazing work being carried out. Dr Ray Montague (BrisDoc Chairman) and Dr Mike Taylor (Lead GP from BrisDoc’s Homeless Health Service and Chairman of the BrisDoc Community Fund) made a week-long visit to Kampala. What follows is a fascinating diary account of their time at the Wellsprings project. We set off Saturday morning from Bristol Airport to Kampala via a short connection stop off in Amsterdam. I was fortunate to have a Ugandan lady sitting next to me during the flight who was a useful source of information on Kampala. A hot topic of conversation is the “border border” motorcycle taxis that we will no doubt encounter during our time there. We were met at the airport by our host Herbert. Our first impressions, it’s not hot! … We are 3000 feet above sea level so the air is cool and fresh. The scenery is dominated by rolling landscape with hills everywhere. 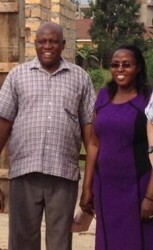 After a short drive, we arrive at Herbert’s home where we receive a warm welcome from Eve, Herbert’s wife. It is now 2am and after such a long flight we are keen to find our beds zzzz. We wake up to the sound of gospel singing from outside. The singing is continuous and the full harmonies accompany our breakfast. There is no break in the music. We are well prepared for our first experience of Wellspring. We drive out at 10.15am for a church service that starts at 10am. We are now operating “Uganda time”. The greeting is universal. You are welcome, says Allen. You are welcome. You are welcome. The music is already in full flow. The lady on lead is Jackie supported by an amplified choir and band. I see my opportunity and hide myself in the band with my cornet (trumpet). Herbert is on guitar and feeds me the key every now and then. Mike is invited to say some words and improvises an address based on C.S Lewis that hits the spot perfectly. It gets dark surprisingly quickly. It’s easy to forget that the days on the equator are the same all the way through the year. Each day is an equinox. An interesting spin-off of this is the Ugandan clock. Time is counted from the first hour of light, and then the first hour of darkness. What we might call 7pm is 1 o’clock in the evening. The potential for confusion is enormous but doesn’t seem to happen. The morning ritual is established; shower, mosquito repellent, anti malarial tablets, dress….. long trousers…. long sleeve shirt. Breakfast with Herbert, Eve and their family is a mixture of cereals, toast, tea and coffee combined with something more local, often Chapatti, samosa, breakfast matoke, maize porridge, and the occasional “Rolex” (Omelet rolled into a chapatti…. rolled eggs). We are escorted again to Wellspring and meet the team. It turns out that we have met everyone already the day before; but now the colourful clothes have been passed over for more suitable office wear. Allen who greeted us yesterday now welcomes us again. Jackie is Eve’s assistant. Denis is the project and community manager. Roger does the IT. Denis gives us a tour of the Wellspring site. Then we are introduced to the children across 6 classes, the teachers, the head teacher (Stephen), and then go to met Constance and Kenneth in the current Wellspring Clinic. Straight off, it’s clearly evident why the current clinic needs replacing. 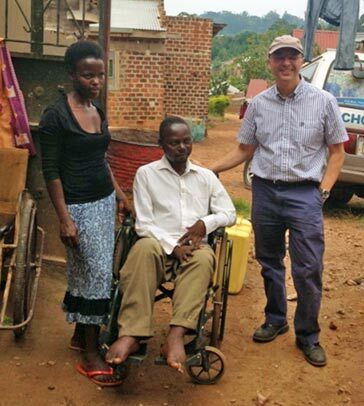 It is ill-equipped and far too small to deal with the health issues faced by this ever-growing community in Kampala. The work done here by the Wellspring Project and the BrisDoc Community Fund will go a long way, transforming the lives of people here in Uganda. Constance is a very experienced Midwife and responsible for upwards of 100 deliveries a year, with three in the week we were there. She also manages a queue of minor illness each day alongside Kenneth who is a Clinical Officer. This requires 2 years training and is equivalent to a Physician’s Assistant. They seem to have access to doctors occasionally. Mike and I spent a few hours in the clinic observing and exploring how we might be able to contribute. The old clinic itself is a small, ill-lit area comprising a cramped waiting area, 2 consulting rooms, a corridor/ treatment room and a bedded area at the back. Rubina sits by the door in a rudimentary reception area opposite a small room with a microscope and shelves of ancient looking bottles with names like Leishmans reagent. Constance is seeing patients that have found their way to the front and into the seats opposite her trolley, the next patient often joining the consultation of the one in front in order to bag the seat. Confidentiality clearly not a concern here. I have also noticed that there is not a sink in sight. Kenneth has the main consulting room and spends a good deal of time managing test results and patients with HIV. He is kindness personified and speaks incredibly softly across his desk. Very little examination takes place. It seems to be all about the test result. Again, no sink. Records are made on small sheets of paper which are added to an index system of sorts held in the small reception area. 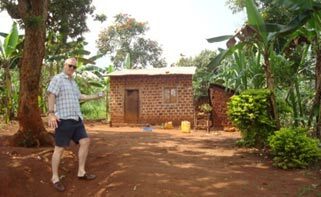 Although the more educated people seem to speak English, the consultations are all conducted in the local language Luganda, which is the language of Bugandu – the tribe of central Uganda. At 11.30am Denis appears and whisks me away to the assembly hall, the whole school is gathered to hear me talk. Rhoda the year 6 teacher bravely stands up and teaches me a song, before long everyone is singing along as I play my cornet. Lunch is taken in the hall. Maize paste, rice and beans alternating with meat stew. After lunch, we return to the clinic for the afternoon. In the clinic on Tuesday, it becomes clear that there is stuff the team want us to help with. Mike meets Lynette who they suspect may have autism and I meet William who has spina bifida… is there anything else to be done? The centre piece of the day is our much-awaited visit to the new Health Centre being built and funded by BrisDoc’s Community Fund. We arrive at a building site and the shell of a large 2 storey building. Is this to be a clinic or a small hospital? We are overwhelmed by the ambition of the project. There is to be a 4-6 bedded maternity unit, a theatre for hysterectomies, a Children’s clinic upstairs and 4-6 consulting rooms with a lab and pharmacy downstairs. The foundations have been laid to accommodate up to 3 more floors. Herbert is talking about ambulance access…. for admission, rather than onward travel! Mike looks worried. Not what we were expecting. But Kampala is growing rapidly (in fact, Kampala was recently named as the 13th fastest growing city on the planet), and there are communities both rich and poor on every side. This will be the only significant health estate this side of Kampala. That this building is needed is beyond doubt. But how to complete it and how to run it? We will have some serious conversations ahead of us. I have an invite to join this charitable enterprise for the afternoon. 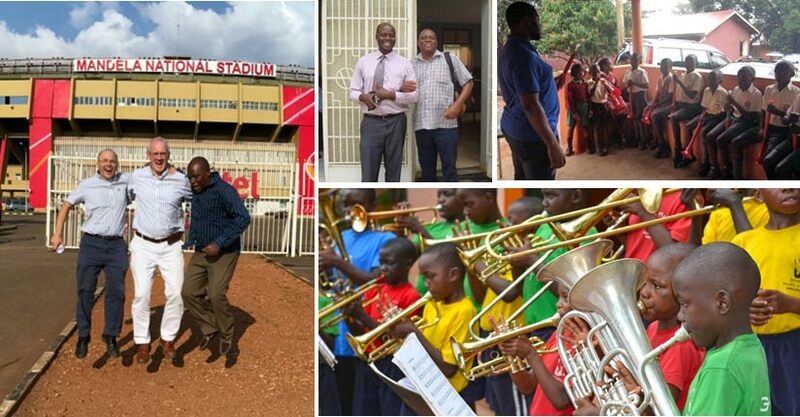 A team of East African refugees and orphans, who are now competent brass musicians and teachers, who attend 13 different schools in Kampala teaching the rudiments of brass music to kids that have no other formal music exposure. 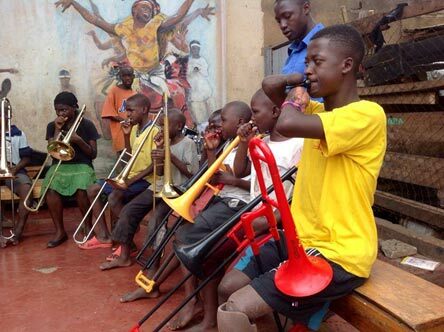 They are encouraged by a cohort of professional musicians from the UK and a residential support team in Kampala. They have a base called “the bandstand” next to an orphanage in central Kampala. It is exactly that …a sheltered bandstand in the middle of the conurbation, with a lock up container where they house 300 brass instruments and a repair workshop. Tuesday night is senior band night. My plan is to see one of their outreach workshops, join a rehearsal and then leave them with my (spare) cornet. A black taxi van spilling over with people and brass instruments draws up in front of me. Some room is found and I pile in. I meet Stuart, a retired head of music from a school in the Midlands who is one of the trustees. He is over with his wife as visiting conductor whilst the full-time program lead is in the States, and Fiona, who is a social worker and IT specialist and also happens to play the tenor horn. She is helping the attached orphanage with a new database and might be able to help with a similar project at Wellspring. The van arrives at a primary school in Kampala. Ronald and Lily, both East African refugees who have been brought up in an orphanage connected to the charity take two separate groups. 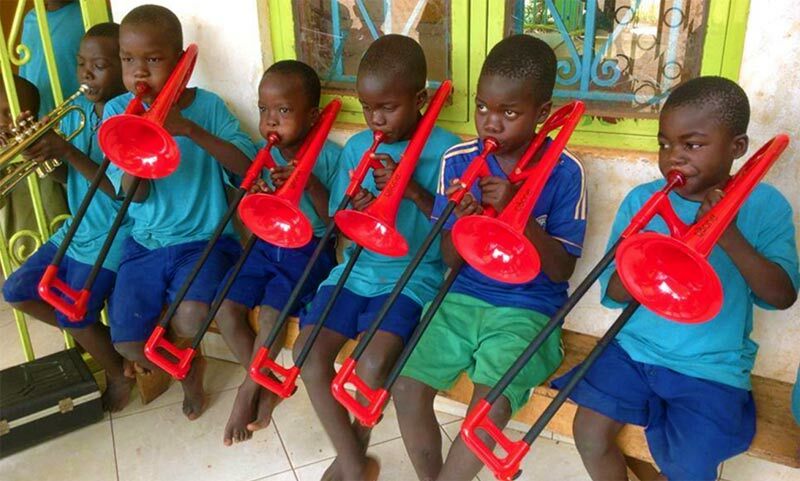 One, of beginners, is learning the basics on a plastic trombone like instrument called a P buzz, whilst the second are beginning to make some decent sounds on proper instruments. I need to persuade these guys to come and do a session at Wellspring. 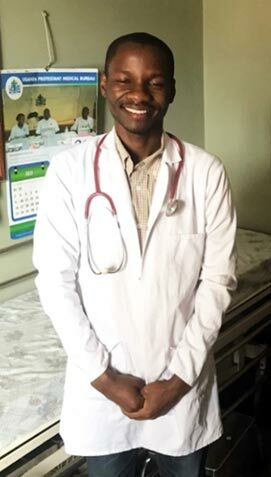 Today is the day that we meet Edward, a very old friend of Mikes’ who has been an ENT (ear, nose and throat) specialist in Kampala and is now retired. Mike stays at Wellspring to wait for his friend, whilst I join the community healthcare team on their rounds. Each week Denis and Rubina go out into the District and deliver some basic physiotherapy to some children, disabled mostly by cerebral palsy. I meet Alex who has a spastic hemiplegia and a very unstable gait, mostly due to an inverted ankle. He might be helped by caliper. A 40-year-old man with progressive muscular dystrophy receives a wheelchair. His family history suggests nearly all of the men of his family have suffered the same fate. His wife seems thin but has no difficulty lifting him right out of his old wheelchair and into the new one. In these desperate circumstances, one cannot fail to be impressed by the determination to continue caring. We spend some time with Edward, who is a fantastic resource and is able to help us work out some treatment plans for some of the children we have seen. We are hoping he might take a more active interest in the project following this introduction. 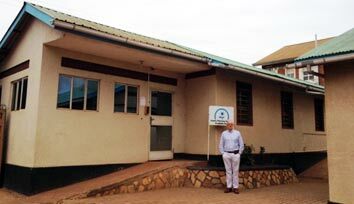 We meet Dr Richard, who works in Obs and Gynae at the main hospital in Kampala. He is very supportive of the new build and has no problem with clinical teams from the UK getting involved. Today we experience our first properly torrential downpour, it is currently the rainy season here so not unexpected. The bumpy ride to Wellspring is now feeling quite familiar. All the rain from last night is already absorbed with only the faintest sign of moisture on the roads. Everything now fresh and green, or soil red. Mike went back to the clinic to do some good work and I got drawn into conversation in the boardroom with Chris, who I took for an accountant, but turns out to be in charge of community engagement. He asked me how it was that a country so heavily in debt was still able to offer help to a country like Uganda? The main event today was a meeting with William, the chairman of the Wellspring board at 11am. He arrived in “Uganda time” at midday. We had an honest meeting where we expressed our concerns about the slow progress of the project, and its combined overambitious scope. However, by the end of our meeting we are won over by their enthusiasm and strong opportunistic future vision. He has agreed that producing more detail around the business case is something they’re now going to prioritise. The fundamental idea remains sound and everything suggests that they are being well supported centrally. A day off!! Herbert has agreed to take us on a trip to Lake Victoria. We take the scenic route through lush vegetation growing out of their rich red soil. Brick firing by the side of the road is a micro industry here. The soil is processed and fermented before firing and drying. We pass termite mounds, avocado trees, jack fruit tree, sweet potatoes, beans, eucalyptus forests. We were hailed by an old Ugandan man in a suit using a crutch needing a lift up the road to a funeral. Unfortunately, our car was full and we were unable to help. We stopped a few times. Firstly, to take some pictures with an older lady cooking a chicken by her hut. As we chatted by the roadside a “border border” motorbike flew past, “three up”, coming with the old man on his way to the funeral waving his crutch in celebration as he passed. Meanwhile, Mike chooses a retirement home for himself. Further on we found another more primitive but perfectly functional hut with a view over the valley and swamp. Wild chilli plant growing out of a tree stump. We spend some time soaking up the incredible views at the lake before setting off. On the way home, we pass the funeral which was now in full swing and the road crowed with hundreds of people. Our final day and a final Ugandan breakfast, Mutoke… it looks like a banana, tastes like a potato, very tasty and very healthy. We reached Wellspring for 10am. Once again, the children and staff have returned to their bright and colourful civvies. Mike taught his own version of rounders / baseball whilst I gave a final cornet lesson to a class of 15. The stars today were Owen age 13 who mastered BCDEFG after 10 minutes on the instrument and Derek who managed to play high Cs!! The rest of the day is all about packing and tying up loose ends. We have a last meal together preceded by another game of rounders for all the Wellspring team who can make it, this time at Herbert’s place. As we head home I reflect on an inspiring trip, made all the more special by the people and communities we met along the way, and a project in the making that will change lives and facilitate change and opportunities for a community born into poverty. It makes you reflect on some of the things we all tend to take for granted such as access to free education and healthcare. The people we met involved in this project are truly an inspiring example of “patient care, by people who care”, the BrisDoc way.